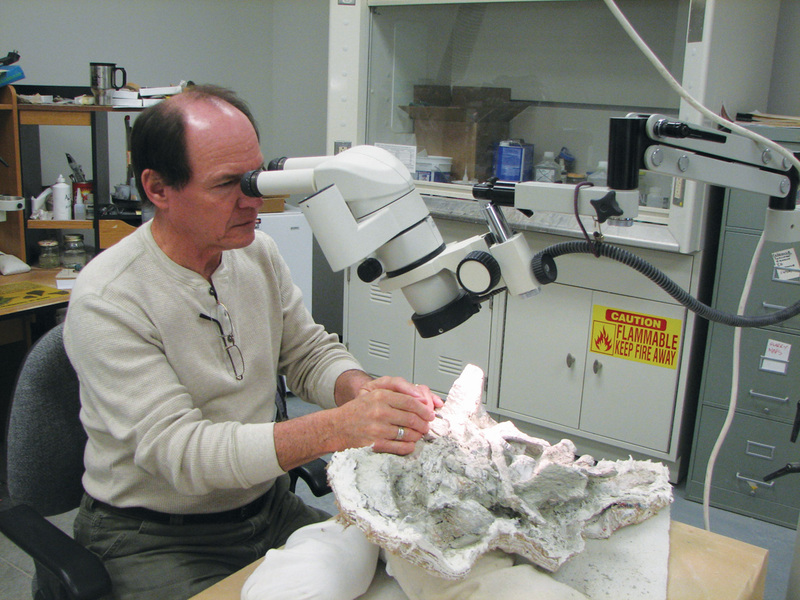 UGS fossil preparator Scott Madsen uses a microscope and carbide needle to prepare fragile iguanodont bones. 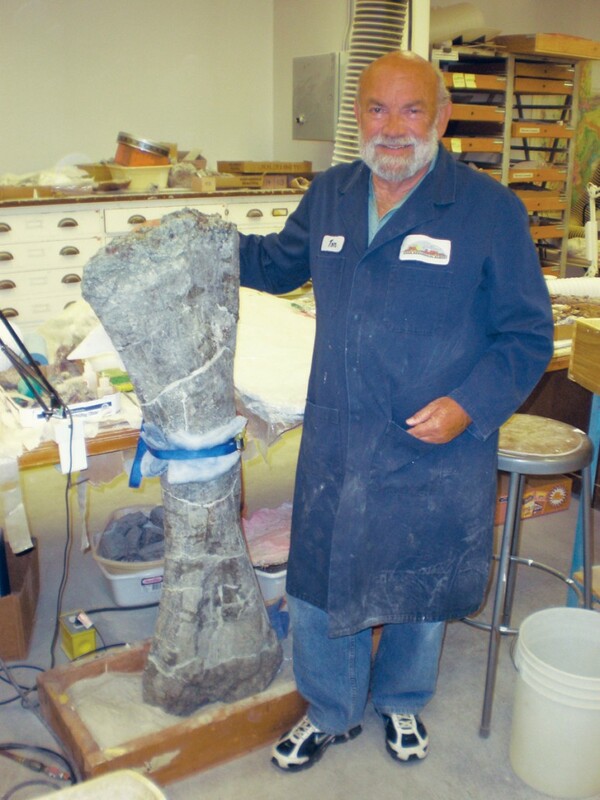 The science of paleontology is the study of ancient life. By studying extinct organisms, paleontologists can attempt to reconstruct past ecosystems and understand how animals and plants adapted to the environments in which they lived. Evidence of this ancient world comes from the fossilized remains of life that have been quarried from rocks or excavated from sediment. But before we can fully appreciate or understand these long-extinct organisms, the fossils must first undergo a long and painstaking process of laboratory preparation. Although most of the fossil bones you see on display in museums might look strong, most of them were not found in that condition. A typical fossil is riddled with cracks, pieces might have eroded away before it was collected, or it may be porous as a sponge. Some bones are as thin as paper and others might be as small as pinheads. A preparator needs to learn how to deal with all of these problems so that bones can be safely studied, stored, and displayed. 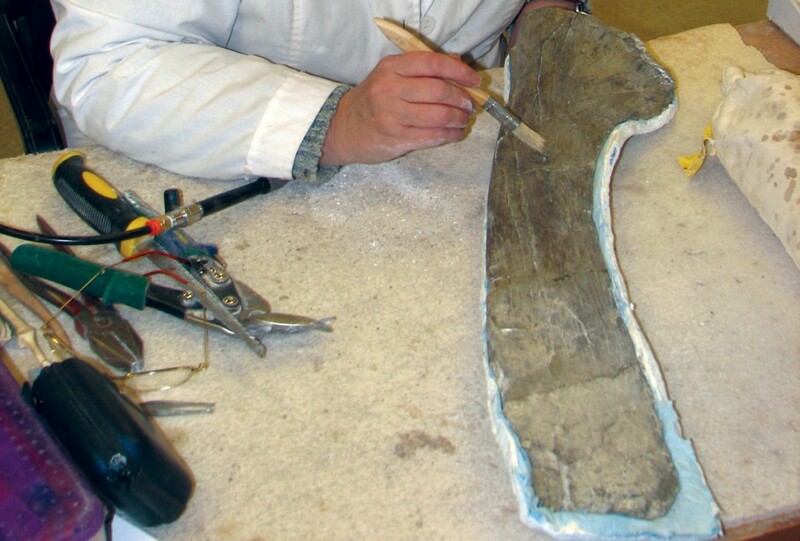 Fossil preparation has changed a lot since the old days of the hammer and chisel. On a typical day, the “prep lab” at the UGS will be filled with the buzz of airscribes (small handheld pneumatic jackhammers). These tools gently pulverize the rock around the fossil and allow the preparator to expose the bone a little at a time. The preparators at the UGS also use miniature sandblasters to remove rock. As cracks in bone are encountered, they can be filled with glue, or the bone fragments can be pulled apart, cleaned piece by piece, and glued back together again. Shellac is also a thing of the past. Modern prep labs use special plastic materials dissolved in solvents to reattach and consolidate spongy and shattered bones. Dental tools are still handy for scraping off small bits of rock, although these have mostly been replaced by needles made of carbide and other strong metal alloys. 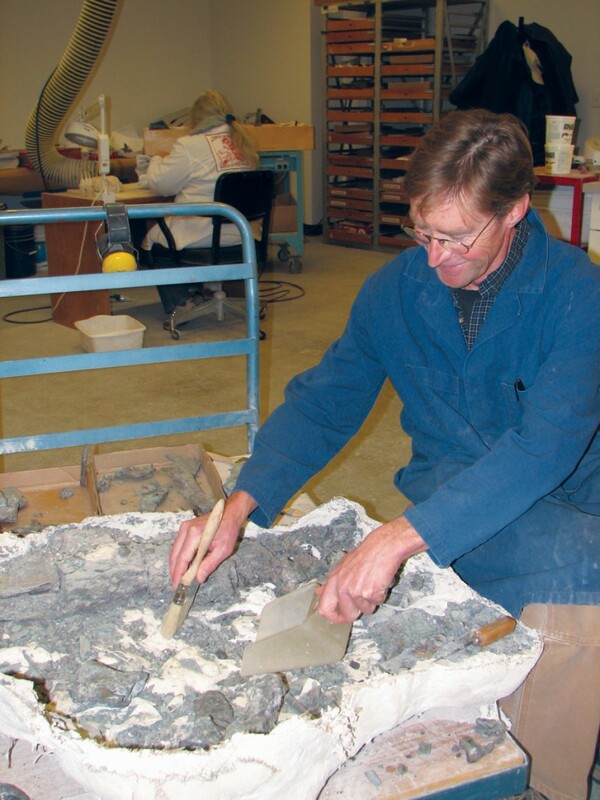 UGS fossil preparators Don DeBlieux and Scott Madsen, and a small team of dedicated volunteers are currently busy preparing several dinosaurs from Early Cretaceous-age (145 to 100 million years ago) rocks of Utah. 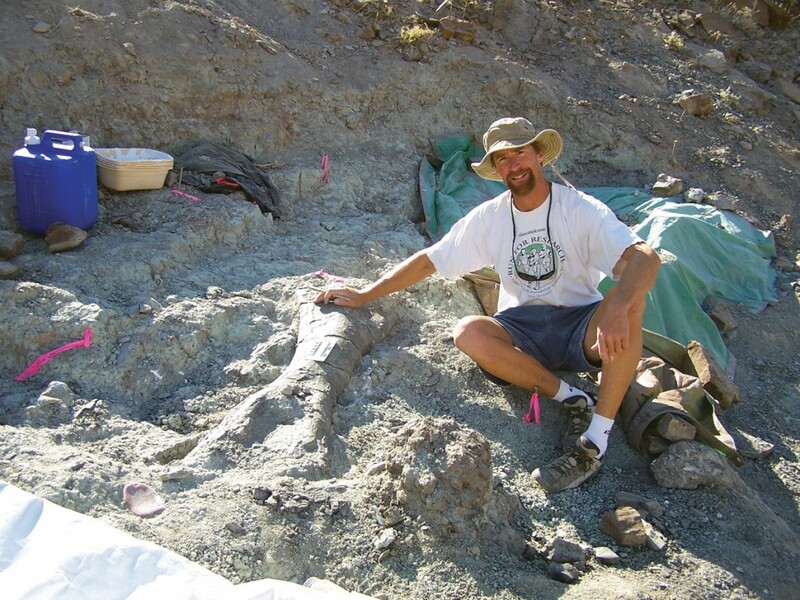 These include the skeletons of new species of plant-eating dinosaurs (iguanodonts) and new species of small carnivorous birdlike dinosaurs (similar to the famed sickle-clawed Utahraptor), all from quarries near Green River, Utah. Many of these bones are so small and delicate they must be prepared under a microscope using carbide needles. When new plaster field jackets are opened in the lab, surprises are common. One jacket, known from field observation to contain part of an iguanodont tail, was also hiding three skulls, including those of a juvenile iguanodont and a crocodile; when turned over, the same block of rock revealed yet another tail, that of a small carnivorous dinosaur. A less welcome surprise was a scorpion that had somehow managed to survive being entombed in a plaster jacket for 15 months! It was later returned to the wild. 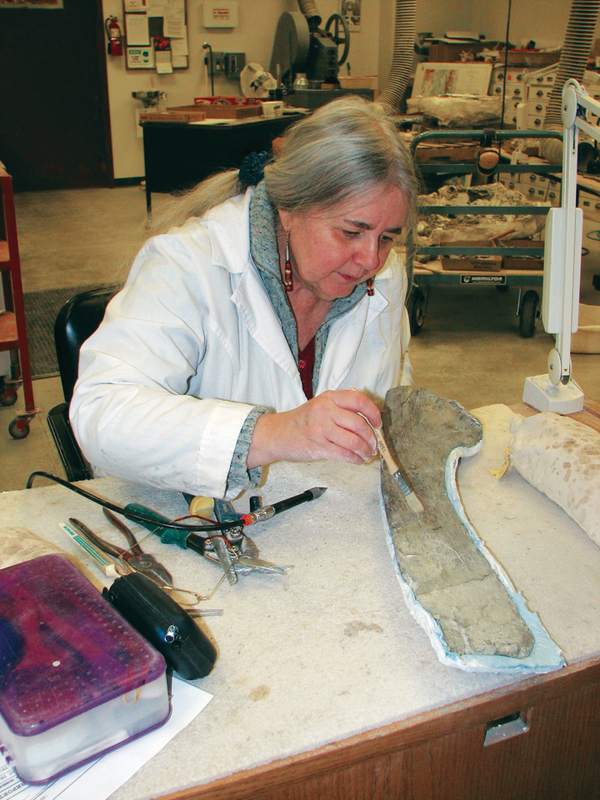 Fossil preparation is slow, painstaking work. All of these projects will take years of labor to complete, but when finished will reveal new and interesting chapters in the story of life on Earth.